What is innovation for the creative industries? When discussing innovation, we often think about grand technological breakthroughs. Yet, at the same time, other sectors, such as the creative industries, are often praised for their innovative capabilities. What is innovation in a sector that is defined by a continuous development of new paintings, websites, plays, marketing campaigns or games? What does innovation mean in a research project entitled cultures of innovation in the creative industries (CICI)? One of CICI’s sub-projects aims to unravel how creative entrepreneurs see innovation, and how innovation occurs within the creative industries. Ongoing research on this sub-project has been presented on the XIIIth International Conference on Arts and Cultural Management (AIMAC) in Aix-en-Provence and Marseille between June 26th – July 1, 2015. In this presentation, we have sought to refine the conceptualization of innovation specifically for the creative and cultural industries. We have done so by looking closely at the definitions, experiences and interpretations of innovation by creative workers in- and outside their particular field of work. Our findings are based on an analysis of 25 in-depth interviews. Our take on innovation hopes to do justice to the manifold practices of creative industries entrepreneurs. A significant finding of our research is that the overall conception of innovation among workers in the creative industries is still a fairly traditional notion of technological improvement and the adaption of groundbreaking technologies to the manufacturing of new products. Another often heard example was that of 3D printing. Such an invention can be used as input in the creative process, generating innovative outputs. Thus, several of our respondents tried to synthesize existing common notions of innovation with their own working practices. Nevertheless, many also dismissed such linear models of innovation and focus much more on the exceptional nature of their specific creative industry. Here, the focus was rather on ‘small’ innovations inherent to creative work. Similarly, while rejecting the idea of being specifically innovative individuals, several creative workers saw their work as innovative in a self-evident way. Innovation is part of their everyday work. In addition to traditional ideas of (technological) innovation, our respondents referred to social and communicative effects of innovation. Here, innovation is only of value if it has a wider social or societal effect, in a sense that it should have an impact on the generation of a stronger community, a better society, a sustainable environment and an overall improvement of the quality of life. This holds for innovations in products as well as in services. Nonetheless, in all cases, it has become clear how the creative workers in this study embed their own work within the economic and social networks of their trade: something is innovative in one specific sector, for one specific client or for one specific artist. It is innovative within a specific field. Why do creative entrepreneurs, businesses and artists have the tendency to flock together? Yosha addressed this question on the Creative Networks and Cultural Ouptut conference at Trinity College Dublin (19-20 June 2015). In her presentation, Yosha investigated the relation between social networks and creative clusters by studying the social and locational practices of clustered creative workers. Her research explored how social interactions and networks leave an imprint on places, and in this process, transform a place’s social and cultural value into an image that transcends the actual creative workforce and inhabitants. The hypothesis is that clusters are, in this way, engraved with their residents’ and visitors’ characteristics and develop a social image. Building upon 43 interviews with creative workers in small-scale creative clusters in The Netherlands, this research indicated that this socially constructed image has a profound influence on the place’s reputation, and that this reputation serves a double role for creative entrepreneurs and artists. First, the networked reputation of a place attracts new creative entrepreneurs, seeking to reap the benefits of these social networks. Second, being located in the proximity of an influential creative network may provide a ‘seal of quality’. Hence, creative workers are attracted to locations with potentially relevant networks, might use this network in informal interactions (e.g. ‘smalltalk’) and formal collaboration, and use the reputation of the place in order to present a creative, professional or ‘connected’ image. 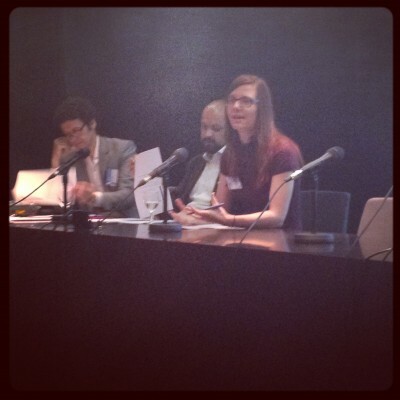 On April 24 2015, Yosha presented some of her ongoing work on place, reputation and creativity in Chicago at the From Kreuzberg to Williamsburg: Exploring the trans-local nature of cultural scenes and the creation and diffusion of knowledge, practices and value(s) across space, scale and industry session of the AAG annual conference. In short, her presentation addressed how creative workers and artists talk about space and places in the story they tell about themselves. An important conclusion here is that a place’s reputation plays an important role in locational decision making, as well as the identity of the creative worker. It is strongly related to social networks, romanticised views of other (creative) places far away, and a negative attitude towards ‘competitive’ places. The first CICI survey is open! As of today, the first survey for the CICI project is available online. Are you a Dutch creative entrepreneur or an artist? And are you located in a creative business complex? Complete the online ‘Cultures of Innovation’ survey now and win great prizes (and help scientific research creative clusters in the process)! The CICI team is looking for a student assistant! Het Erasmus Research Centre for Media, Communication and Culture (ERMeCC) zoekt op korte termijn een Student Assistent ten behoeve van het “Cultures of Innovation in the Creative Industries” (CICI) project. Werkzaamheden bestaan uit onderzoeksondersteuning en dataverzameling (standaardinformatie locaties updaten; survey management en uitwerken van interviews); het onderhouden van diverse webpagina’s (Nederlands en Engelstalig); assisteren bij organisatie en uitvoering van CICI en ERMeCC activiteiten; meedenken over nieuwe initiatieven ten behoeve van de zichtbaarheid van het project en diverse werkzaamheden t.b.v. communicatie en informatievoorziening. De studentassistent stemt de werkzaamheden af met en wordt aangestuurd door de projectleider CICI, tevens managing director van ERMeCC. We zoeken een communicatieve en flexibele assistent, met affiniteit met de onderzoekthema’s van CICI / ERMeCC; ervaring met CMS (bij voorkeur WordPress en/of Typo 3); een zelfstandige, gestructureerde en nauwkeurige werkwijze; en uitstekende beheersing van Nederlands en Engels. Omvang is 0,3 fte (3 dagdelen ofwel 1,5 dagen per week), werkdagen en tijden zijn in overleg te bepalen. Het gaat om een tijdelijke functie tot 1 september 2015. Het salaris is conform de CAO voor studentassistenten. Graag sollicitaties vóór 2 december 2014 via de mail aan Dr. Erik Hitters, projectleider (hitters at eshcc.eur.nl), met een CV en cijferlijst als attachment.